This is the second of our overview series of the main hotel loyalty schemes. Each scheme will be covered over two articles over two days. One will list the basic facts of the scheme – basically ‘How does IHG Rewards Club work?‘ – whilst the other will be my subjective view of what is of particular merit. IHG Rewards Club is the loyalty programme for over 5,300 hotels globally. They operate primarily under the InterContinental, Crowne Plaza, Hotel Indigo, Kimpton, Holiday Inn, Holiday Inn Express, Staybridge Suites and Candlewood Suites brands. The small Regent chain of luxury hotels was added in 2018. The IHG Rewards Club home page is here. What is the geographic spread? Excellent. IHG is the largest chain in the UK, with a huge number of Holiday Inn and Holiday Inn Express properties. They also have excellent coverage across much of Europe and there are few places in the world where you will not find one of their hotels. Except Sweden. Do I use them? Yes, but less than I did since I gained Marriott Gold and Hilton Diamond status in the past year. Those status levels offer specific benefits (guaranteed lounge access, guaranteed 4pm check-out with Marriott) which are sometimes invaluable. The key benefit of IHG Rewards Club is that it allows me to earn points quickly at mid-market hotels via their regular bonus promotions such as Accelerate and then redeem them for luxury properties. Whilst status benefits are admittedly weak, even for top-tier Spire Elite members, I get around that by buying InterContinental Ambassador status each year which has guaranteed benefits such as 4pm check-out, albeit only at InterContinental properties. 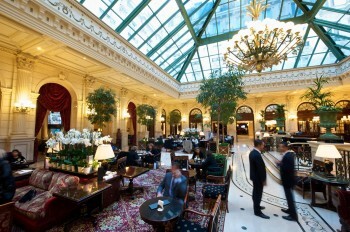 InterContinental has high quality hotels in the big cities I tend to use most – London, Paris (photo below), New York, Hong Kong, Boston, Dusseldorf etc. All I am waiting for now is for them to open a beach resort in the Middle East (not happening, there is a 3rd Dubai IC on the way, but this one isn’t on the beach either!) and for the forthcoming InterContinental Venice to finally open. It is worth noting that IHG actually runs TWO loyalty schemes. As mentioned above, there is a fee-based loyalty programme for InterContinental properties called Ambassador. I reviewed the benefits of InterContinental Ambassador here. This means that IHG Rewards Club benefits are NOT great at InterContinental hotels as they favour Ambassador members. Gold Elite – 10 nights or earn 10,000 base points. Only major benefit is a 10% bonus on base points and a welcome gift. You can also receive Gold status for taking out the free IHG Rewards Club Mastercard credit card. Platinum Elite – 40 nights or earn 40,000 base points. Benefits are 50% bonus on base points and a non-guaranteed upgrade to a ‘better’ room. You can also receive Platinum status for free by taking out the £99 IHG Rewards Club Premium Mastercard credit card. Spire Elite – 75 nights or earn 75,000 base points. Benefits are a 25,000 point bonus for reaching or retaining Spire (or a free Platinum card for a friend), 100% bonus on base points and a non-guaranteed upgrade to a ‘better’ room. These benefits are undoubtedly weak. In reality, only at Crowne Plaza hotels – where a Spire may receive lounge access – are you likely to receive anything worthwhile. In most hotels, elite members receive a welcome gift. It is usually the underwhelming choice of a few hundred points depending on brand, or a free drink and snack from the hotel bar. In Hong Kong last year, the InterContinental gave me a HK$135 (£13) food and beverage credit as a Spire Elite member. They also gave me two free drink vouchers for being an Ambassador. It isn’t exactly life-changing. All guests at IHG hotels receive free internet – it is not an elite benefit. Platinum members can roll over their additional elite nights into the following year to aid requalification. Gold and Platinum members can request late check-in and check-out but it is not guaranteed. Rewards nights DO count towards renewing elite status. The full table of elite benefits is here. IHG Rewards Club does not offer lifetime status. Most brands earn 10 base points per $1 spent. It is only base points that count towards elite status renewal. Staybridge Suites and Candlewood Suites give a reduced 5 points per $1. IHG Rewards Club is generally very aggressive with bonus point promotions, especially the recent ‘Accelerate’ offers. Our ‘Hotel Promos‘ page contains details of current promotions. Redemption rates for hotels run from 10,000 points in Category 1 (the cheapest Holiday Inn Express properties) to 70,000 points in Category 6 (the higher end InterContinental properties in London, New York, Bali etc). The 70,000 point tier was only introduced in 2018. You will generally receive better value by redeeming for more expensive hotels but the new 70,000 point top tier has made the differential lower. Most of the ‘freak’ low valuations, such as 10,000 points per night for the fully refurbished Holiday Inn Wembley in London, have now gone. There are no discounts for extended stays. IHG runs regular ‘PointBreaks’ offers. Every three months, 150-200 properties globally are offered for just 5,000 to 15,000 points per night. If you can be flexible with your holiday plans, there some excellent deals here. Here is my article on the current batch which are bookable to 30th April. IHG does NOT have ‘last room availability’. Hotels are required to make 5% of their rooms available for redemption each night, but do not need to offer more when that quota is booked. A 5-star 60,000 point redemption would typically require a Gold member to spend $2,000. However, because of the heavy number of IHG bonus point promotions, the actual spend required would be substantially less. IHG Rewards Club points expire if a) you do not have elite status and b) you have no activity on your account for 12 months. Simply making and cancelling a redemption will count as ‘activity’ and reset your expiry date. I wrote a full article on IHG’s expiry rules here. Some hotels put multiple room categories up for redemption on quiet nights, for example Standard and Deluxe Rooms. There is no additional points cost if you choose a Deluxe Room even though it would be more expensive if bought for cash. Yes. ‘Cash and points’ is ALWAYS available as an option. In most cases you can use $70 to reduce the number of points required by 10,000 points, or $40 by 5,000 points. This is not necessarily worth doing, however, since you can buy points at the same price at any time in the future if you need them (see ‘Purchasing & Transferring Points’ below). IHG Rewards Club point can be transferred to a large number of airlines including Avios. The ratio is a weak 5:1. If you did not want to use your points for hotel stays, you may get better value cashing out for UK retailer gift cards. 4,500 points gets you a £5 online e-code for Amazon etc. You will never get better than 0.16p per point this way compared with 0.5p per point if redeemed smartly for hotel rooms. Yes, see ba.com here. You can earn Avios by showing your British Airways Executive Club card at check-in – the amount will depend on which IHG brand you are staying with. You will not earn any IHG Rewards Club points. However, you must still be a member of IHG Rewards Club in order to do this. Can you get elite status with a UK credit card? Yes, the IHG Rewards Club Premium Mastercard (£99 fee, see my review) gives you automatic Platinum status. The free IHG Rewards Club Mastercard (see my review) gives you automatic Gold status. Is IHG Rewards Club an Amex Membership Rewards partner? No. You could transfer your Amex points to Virgin Atlantic and then on to IHG Rewards Club. This is poor value – one IHG point per Amex point is not good – but on the upside the transferred points would count towards elite status. 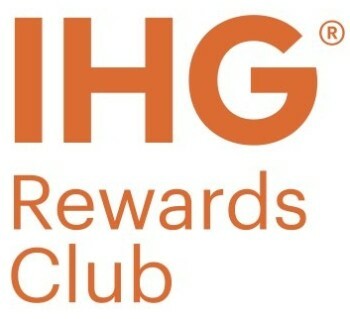 You can buy IHG Rewards Club points from $13.50 per 1,000 via this link. As long as you have a 5,000 point balance, however, you can buy points for $7 per 1,000 in a roundabout way. You need to book a redemption night at a 15,000 point per night hotel, choosing to pay using 5,000 points and $70. After booking, cancel the reservation. Your $70 is not returned – instead you receive 15,000 points back into your account. You are $70 out of pocket but 10,000 points better off. Points can be transferred to other members at a cost of $5 per 1,000. This is reasonable and I have done it in the past to move very small amounts for ‘nearly empty’ family members. You can transfer Virgin Atlantic Flying Club miles into IHG Rewards Club points at a ratio of 1:1. You can also transfer Finnair miles to IHG Rewards Club at a ratio of 2:1. Virgin transfers count towards elite status but, according to recent reports, Finnair transfers do not. Because you receive 25,000 bonus IHG Rewards Club points for reaching or retaining Spire Elite status, it would make sense to do a transfer from Virgin Atlantic late in the calendar year if you were only a few thousand points short of Spire. Part two of this article tomorrow will cover my personal opinion of IHG Rewards Club. Unlike Hilton at least IHG still has an old-fashioned points-pricelist for its hotels, and the points can be very handy at busy times – last World Cup we stayed in IHG properties in Brazil on points where cash prices were sky-high. Another benefit is dodging the nasty “taxes” and fake fees added to displayed prices, in countries that permit this kind of swindle. But the saddest thing is the demise of IHG’s big drawcard – Pointsbreaks – enhanced to mincemeat this year. As the new PB system does actually include places I might go, I do not see it as getting worse. We have three nights in the centre of Nice in a couple of weeks, all for 45 000 points on a new-type points break. Public non-refundable rate is now €126 (members €122,22). €0,84 per point. Cannot complain at that! When using the ambassador certificate can you pick which night is free i.e. can you pick the more expensive one to be free? No, it really is the 2nd night that is free. Sometimes, the 2nd night would be more expensive as a revenue booking but rarely IME. Also note that the first night of the offer is usually more expensive than if booked without the offer IME. I have only used one once and checked which night was more expensive, the Friday or the Saturday and based my decision on that as I had no preference over Fri/Sat or Sat/Sun stay. Ended up the Friday night was cheaper so booked the Fri for the paid night with the Saturday the free night. With black card do you still get 25000 IHG point on your second year of qualifying for Spire elite (75K points). I mean if you already had the same benefit previous year? Holding IHG Black Card and obtaining Spire are separate things. But yes, you get the 25k in every year you hit Spire (spending on the IHG credit card is just one way to get there). In hindsight I should not have cancelled by IHG black card. Still have white. Have put enough spend already in 3 months and would have earned more than half way through 75K IHG points already if I had retained that. I have IHG free night expiring (Creation Black Card) in August this year. Looking at T&C it suggest that I need to book and stay before that date (1 year from issue). I was under impression that it is booking only within a year but redemption can be any date after that, but sadly that does not seem to be the case! Well at least the website has allowed me the booking in October. Lets see what happens. Anyone with such experience in redeeming IHG Black free night certificate? I was told last week on a call to customer services when I was going to make a reservation at the IC Davos that the redemption of the Creation CC certificate can only be done over the phone so it might be worth checking that Roger. I used mine last year at IC Le Grand and Mrs this year at IC Porto. All redeemed online. I have the same issue, mine is expiring next Feb and I have all my stays for this year already booked but wanted a night in March next year. Will probably have to make a trip just to use it or let it expire…. Does the ambassador free weekend night need to be redeemed via a cash paid booking or can it be a rewards night? I stayed in HI Los Angeles Anaheim, Booked the cheapest room and they upgraded me to presidential suite! Booked the Airline Rate as I am crew. Love my IHG Black card. Cheap as chips! And well worth it when I’m going away on holiday. I get fantastic discounts and upgrades with my airline and use my IHG Black card for stays. £99 well spent as I used to have the Barclaycard IHG Card and was tempted in by Creation for 40k points bonus. Oddly enough in a fairly nondescript Holiday Inn Chester West tonight (on the A55!) as visiting family. I’m gold via the IHG credit card, which I haven’t had for about a year but I still seem to have the status – upgraded to an “executive” room” – hotel isn’t anywhere near full – and a drinks voucher thrown in. £45 for the room + breakfast thanks to the January sale rate and this should bring in about 10000 points from Accelerate promo. I didn’t do quite as well as you, but still far better than I expected. Booked HIE Manchester Airport to get Rocketmiles first stay bonus. I have IHG Gold from credit card. They offered me welcome points or drink voucher. I always take the drink voucher (bit mean to only offer one when I’m with my wife, particularly as Hilton give 2), but usually they’ve already pre-credited the points! I ALWAYS ask for two vouchers, if they are not offered anyway; often last year I just got them without asking, though sometimes I had to beg gently, eleiciting a smile and a made-up-on-the-spot reason: “just for you” or “OK, just as it is Sunday / Friday / Tuesday”. Only turned down twice. Most amusing was the HI Scotch Corner on a 5 000 points break, the manager was on check-in, gave out two vocuchers with my asking, but also a standard Gold welcome letter which stressed very clealry that guests would only get one voucher. Should read ” gave out two vocuchers withOUT my asking!!! If you are looking for an Intercontinental in the Middle East. Try The David Intercontinental in Tel Aviv or closer to home visit The intercontinental in Malta. Both superb hotels.